Punk rock is a style of music, but it also is a way of thinking about and interacting with society. As a style of music, the influence of its energetic arrangements, distorted guitars, and critical lyrics is evident in the work of many of the most important bands from the last 25 years. As an attitude, it continues to shape (rightly or wrongly) media, design, politics, and fashion. With honesty, integrity, simplicity, and humor, What Every Child Needs To Know About Punk Rock explains this cultural phenomenon to young children, helping them to understand the modern world and, more importantly, the adults in their lives. 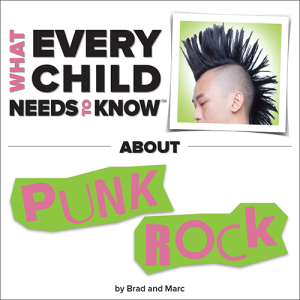 Written by two dads — a child expert and a researcher — What Every Child Needs To Know About Punk Rock is the book for any adult who wants to help young children understand the roots of this ongoing movement.